I built my version of the 12' Mustang from the PM plans in 2008 during my senior year of high school. I used the boat a few times with a trolling motor that summer but never was able to really enjoy "Li'l Tipsy". After 6 years of being away at college and finding a new job, I settled into a house with a garage. I had plans to work on her but it wasn't till my teacher from high school that helped me put her together passed away. It was a hard moment for all of our school as he was a true inspiration and friend to us all. He was a lover of old boats and outboards. This put me back in gear to start pushing forward on restoring "Li'l Tipsy" as soon as I could. I had found several things that needed repair. The fiberglass on the deck and hull had separated from the wet cedar wood and also was full of UV damage from sitting on the trailer. The cross center beam between the seats had to go, I had grown a few inches up and around causing my older self to not fit in the front seat any more. She needed a keel still, somehow I missed putting that on years ago, and needed all the electrical and controls rerouted. I rebuilt the front seat and hand lettered the text and name onto the boat with One Shot and gold leaf. I'm no pro but it looks alright! I purchased a 10HP QD-17 and put a few coats of paint and decals on her. Tipsy received a coat of hot red Interlux paint on the bottom and a new flag. 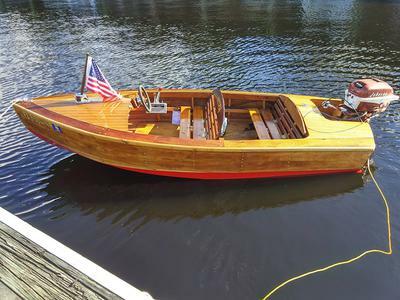 After 3 months of restoration, I was able to launch "Li'l Tipsy" back out into the open waters of Florida in November 2015. Launch day was so rewarding, Tipsy found herself this time at 5MPH! After a few tweaks of a 1956 10HP Johnson and the fuel system, I opened her up to a good 18mph with just myself in the boat. Topped out at 14mph with two of us in the front seat later that day. She's a small boat but she handles the lite choppy waters of the St. Johns quite well. It has been a great project and one that I will hold onto for many years. I have many improvements I still want to make on her. One being that she needs another 5 coats of varnish at least! I plan on flipping her over, another coat of bottom paint next summer when it's too hot for boating. Would I build another one? Yes, but the larger 14' version. She fits 3 in a pinch, I guess 4 technically. But I need more power to get anywhere with that many people in the boat. I have truly enjoyed building this boat and enjoyed every minute out on the water in her. Old wood boats, even ones that aren't the prettiest like Tipsy turn heads. You'll get stopped and asked about the history. Some folks won't believe you built it or that it's only as old as 2008. Building a boat is more than just a woodshop project, it's creating memories with those who you may not get to spend forever with. Get your family and friends involved in the process and in the enjoyment of boating.